Reader question: "There are lots of HUD homes for sale in my area. I would like to include them in my house hunting, because I've heard you can get a good deal on these properties. 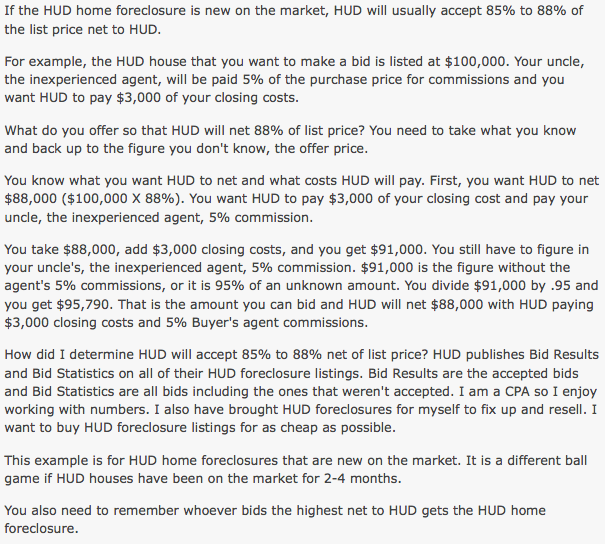 The trouble is I'm a first-time buyer, so I'm not familiar with the offer / bidding process for HUD foreclosure homes. How much should I bid when making my offer? Is there a specific formula, or should I just use comparable sales?" I recommend that you work with a real estate agent who is familiar with the bidding process for HUD homes. It's different from buying a "regular" home, where you're dealing with a homeowner. In fact, the Department of Housing and Urban Development requires that you submit your bid through a licensed agent or broker who is registered to make offers on HUD homes. Your agent will do a lot of the work for you. But that doesn't mean you can coast along on autopilot. You need to be actively engaged in the process. You need to know how to make an offer on a HUD foreclosed home. We'll get to the bidding / offer process in a moment. But first, I want to cover some of the basics. Definition: A HUD home is residential property that has been repossessed by the Department of Housing an Urban Development through the foreclosure process. So now the government owns this foreclosure home. Their goal is to sell it as quickly as possible. If they can make a profit, great. But they're most concerned with recovering their losses resulting from the foreclosure process. The "loss" in this case is the money HUD had to pay to the lender who made the FHA loan in the first place. Remember, the government insures these loans against losses resulting from borrower default. HUD wants to sell the property as quickly as possible. So they use a local real estate agent to list it for sale in the MLS (in some cases). They also list the home on their property website at www.hudhomestore.com. In many cases, these houses are priced below their current market value. Why? Refer back to HUD's primary goals. They want to (A) sell the home fast and (B) recoup their losses from the FHA insurance claim. They're not trying to turn a profit, per se. This is why there's often a potential for savings when buying a HUD foreclosure home. This is where you come in, as a buyer. You can make an offer on a HUD home through a licensed real estate agent or broker. Depending on the market you're in, there may or may not be multiple buyers bidding on the foreclosure home. There's a chance that yours will be the only offer. There's also a chance you'll be bidding against several other would-be buyers. It depends on your market and the desirability (pricing) of the home in question. Believe it or not, most real estate agents aren't very familiar with HUD foreclosure homes. They know what they are, of course. But they don't necessarily know how much to offer for such a property, or how the bidding process works. That's why I recommend working with an agent who has done this in the past. It will prevent a lot of headaches. You need to use an agent when buying a HUD foreclosure home. I touched on this earlier. You need to use a licensed real estate agent, at a minimum. But you should go above and beyond this by finding an agent who has experience making offers on HUD homes (on behalf of clients). You are not obligated to offer the list price. You can offer below the asking price, if you feel you are justified in doing so. I mentioned earlier that these foreclosure homes are often priced below market value. Often ... but not always. They are usually appraised by a professional home appraiser, before being listed on the HUD site. You need to evaluate the price just like you would with any home purchase. Use comparable sales for this purpose. You need to consider how long the listing has been on the market. You can generally get a better deal on HUD homes that have been on the market for a while, when compared to a new listing. Rule of thumb: For a new listing, you should offer an amount closer to the list price. Making a low-ball offer on a new listing will probably just be a waste of time. What's worse, you could lose the property to a higher bidder. If the home has been listed for three months or more, you will have more bargaining power. The low-ball offer is a safer strategy in this scenario. If the listing is new on the market, HUD will generally accept 85 - 88 percent of the list price as net proceeds to HUD. This means if you offer an amount that allows them to net more than 85 percent of the listing price, there's a good chance they'll accept your offer. See the 88 percent strategy below. Generally speaking, HUD is willing to contribute up to 5 percent of the purchase price to the buyer's closing costs. If you are requesting that they make such a contribution, you must include this amount with your initial bid / offer on the home. They will only help you with certain fees (not all of them), so ask your HUD-savvy real estate agent about this before bidding on the property. If your real estate agent is registered to make bids on HUD foreclosure homes, he or she can use the electronic bidding system. This system has made the bidding process a lot more efficient than it used to be. It's another good reason to use an agent who has experience in this area. If your bid gives HUD the highest price for the home (after any closing costs and commissions they must pay), then your bid will be acknowledged. Your agent will then have 48 hours to follow up with a complete contract. These documents would be sent to the nearest regional office. It's imperative that you submit the signed sales contract package in a timely fashion. Having your bid "acknowledged" electronically does not mean the home is yours. They need to receive the contract package in order to accept the offer. If you fail to send these documents, the home could be placed back on the market for other buyers to bid on. This article answers the question: How much should I offer on a HUD home? If you would like to learn more about this subject, you can use the search tool at the top of this page. You might also find this article helpful.